Do you know how hard it is to come up with a title for Potato Salad? One that won't cause everyone to say to themselves "Ugh, really! Another potato salad!" Well this potato salad is my favorite thanks to Tyler Florence. If you're a regular reader (and you should be) you will know my infatuation love appreciation for Tyler Florence. Am I on a list now? Are his "people" reading this? Do they know about my stalking appreciation? Oh, I hope they do. If he would like to contact me and thank me for appreciating him so much feel free! My email address is deelicious.sweets@gmail.com. I could even give him my personal phone number. How about my home address? Would that be more convenient? 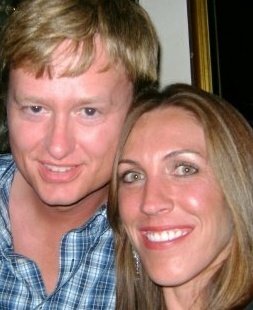 Speaking of love and infatuation, my 15 year wedding anniversary was yesterday, the 14th! Yes, the hubster is aware of my "appreciation" for Tyler Florence and he's okay with it. It brings good meals to the table and we all know that the way to a man's heart is through his stomach (even if it is another man's recipe). Put the potatoes and eggs into a big saucepan of cold salted water. Bring to a simmer. After 12 minutes remove the eggs with a slotted spoon and let cool. Continue cooking the potatoes until a paring knife poked into them goes in without resistance, about 3 minutes longer. Drain the potatoes in a colander and let them cool. Reserve some scallion greens and capers for garnish. Meanwhile, stir together the mayonnaise, mustard, pickles and their juice, onion, remaining scallions and capers, parsley, and lemon juice in a bowl large enough to hold the potatoes. Peel the cool eggs and grate them into the bowl. Stick a fork into the potatoes and lift them 1 at a time out of the colander. Break up the potatoes by hand into rough chunks, add them to the bowl and toss to coat with the dressing. Season, to taste, with salt and pepper. Drizzle with a little olive oil before serving. LOVE capers! What a great addition! And fresh dill... wow, can't wait to try this! That is a good looking potato salad. Yum this looks delicious! I hope Tyler Florence gives you a call to wish you a happy anniversary!! :) You and your hubby are such a cute couple- congrats on 15 years! Congratulations!! and cute about it being another man's recipe!! I think you can never go wrong with a good potato salad recipe. It is kind of like chili, there are a gazillion different ways to make it, and you have to try a bunch of different recipes until you happen upon the one that is so perfect you never go back to the others. I love Tyler. This potato salad looks divine!!! I'm on a list for Curt Smith from Tears For Fears. I completely understand. Happy Anniversary! Love Tyler! I think part of the reason I watch The Great Food Truck Race is because he is the host! Haha great post! Congrats and happy anniversary! And I love potato salad... and Tyler Florence too. So I will definitely be trying this recipe soon. Happy Anniversary! I know everyone has their favorite potato salad recipe but I have yet to find one that I truly love- however if this one tastes as good as it looks in your picture it's sure to be a contender! You are so adorable and CONGRATULATIONS on your anniversary. This potato salad photo actually caught my eye before the title so compliments to you on a fabulous job.